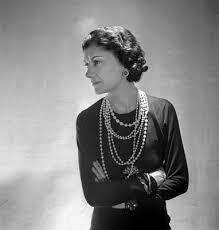 I can't remember when I first heard about Coco Chanel. Chanel like other high end brand names seem to be something that everyone just knows, even if you don't know or follow fashion. 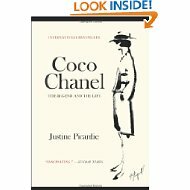 A few months back I realized I didn't know very much about Coco Chanel and decided to do some research. I knew she had started the Chanel brand. I knew her iconic tweed suits and quilted chain link strap bag. I knew about the double C's she chose as a logo but I didn't really know much else, so I chose to read the book "Coco Chanel: The Legend and the Life" by Justine Picardie. There are many books on Chanel but this one seemed to be the most recent and had the best reviews on Amazon. Gabrielle "Coco" Chanel was born in France to an unwed mother and father, who were very poor. When her mother died, her father sent her and her sisters to a convent, where she lived until the age of 18. Gabrielle, who named herself "Coco" reinvented herself and started off as a milliner, while simultaneously networking her way into the British aristocracy. While her personal life is controversial, she led it on her own terms. Coco is depicted as a woman who spoke her mind but yet was fun to be around. She became a legend for understanding the need for simplicity in women's clothing. Coco often said that she designed clothing for a women for comfort, she didn't believe that women should be held back by their clothing. This came at a time (early 1920's) when women were tired of wearing corsets and yearning for something easier. It was interesting to learn that "The Chanel look" remains exactly the same as it did in the 1920's. Her attention to structure and cut were so close to perfection that it has surpassed time. Although, I also learned that after the second world war Chanel actually fell out of favor, especially in Europe. It wasn't until the 1960's that Americans brought her fashions back into the limelight. American Buyers and the likes of Jacklyn Onasis Kennedy and Elizabeth Taylor helped put Chanel back on the map as an iconic designer. Of course, Chanel no. 5, her perfume had already become the most popular fragrance in the world and still remains so to this day. "If you were born without wings, do nothing to prevent their growing." "True generosity means accepting ingratitude." "To disguise oneself is charming: to have oneself disguised is sad." "For a woman, to deceive makes only one kind of sense: that of the senses." "But it wasn't simply the clothes that drew new generations of admirers. Even in old age, Chanel herself seemed to be her own best model, with her characteristic assortment of jewels glittering against a white silk shirt, her way of standing, which came to be emulated by legions of those who followed in her wake." 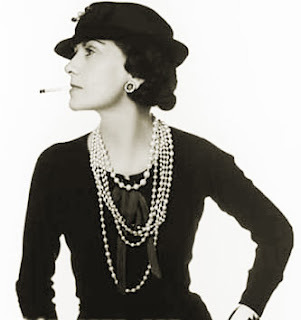 I find Coco Chanel to be inspiring because in a lot of ways I relate to her. I relate to her love of fashion, her determination to succeed and her penchant for hard work. She was a fiercely independent business woman with fashion savvy and an eye for simplicity. While her personal life was complicated and maybe even a little sad, she overcame it and became a successful designer and businesswoman through hard work and determination, something I find very admirable! Check out the book for yourself by clicking here!